This week I attended the Lexington screening of Soul Food Junkies, part of the Good Foods Board Film Series. Local food guru and advocate for justice Jim Embry picked another winner for us to watch and discuss. After seeing the movie on PBS in January, I was looking forward to meeting filmmaker Byron Hurt. The evening kicked off at the historic Lyric theater with local chefs cooking up healthy and delicious soul food to sample. Embry introduced his cousin, Tiffany Bellfield, who shared a powerful story about her own personal journey to better health. It was the perfect lead in to a film that explores our complex relationships with the kinds of food that may be killing us. The death of Hurt’s father at the age of 63 from pancreatic cancer led him to take a closer look at African-American food culture, socioeconomic conditions that limit access to healthier food, and food addiction. Hurt effectively used humor to open up the audience to these serious topics. He understands that people don’t want to be shamed but inspired and motivated. The discussion that took place after the film showed he had clearly motivated his Lexington audience. We heard questions about how to reduce health disparities, improve access to healthier food, and support food justice. Frank X. Walker, Kentucky’s poet laureate and the first African-American to hold the post, shared his vision for the Isaac Murphy Bicycle Club. He wants to connect inner city kids to Lexington’s Legacy Trail by providing them with bikes and equipment, education and training, mentors, and healthy eating guidance. The Good Neighbor Stores is another initiative that shows we’re ready to roll up our sleeves and get to work bringing healthier food to Lexington food deserts. Hurt said the film hasn’t had a bad review and I also give it a thumbs up. Once again I left a Good Foods film and discussion feeling energized and motivated to do more of this important work. 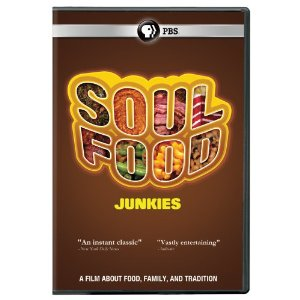 If you are interested in seeing Soul Food Junkies, PBS will re-air it on May 20th. It’s also available for purchase here. The film ended with an inspiring message for all of us in Kentucky: vegetables are soul food. Tags: food addcition, food deserts, food justice, Soul Food Junkies. Bookmark the permalink.